On their website they call it a Chocolate Cherry Cake...but I used their Strawberry filling...so. Do the math. I guess that wouldn't be math would it? That would be like...English or Chemistry or...daggumit. I don't know. Whatever it was, it was ridiculously yummmmy! Look at it. Can we even talk in the presence of such a chocolate vision? Shh...Silence...while I abscond with two forks, and we hide in the closet. You, Me...and Beautiful. Hello Beautiful. 1. Preheat oven to 350°F. Grease and flour a 10-inch fluted tube pan; set aside. 2. In a large bowl stir together cake mix, flour, sugar, drink mix, baking powder and soda. Add oil, eggs, cherry pie filling, sour cream and almond extract. Beat with an electric mixer on low to medium speed for 2 minutes (batter will be stiff). Fold in chopped sweet chocolate. Spoon into prepared pan. Bake for 60 to 70 minutes or until wooden toothpick inserted in center comes out clean. Cool in pan on wire rack for 20 minutes. Loosen sides and remove from pan. Cool completely. 3. For ganache, in a small saucepan heat cream just to boiling. In a medium bowl pour hot cream over bittersweet chocolate; let stand 5 minutes. Stir until chocolate is melted and mixture is smooth; stir in rum. Place bowl with chocolate in a bowl of ice water and let stand about 20 minutes or until thickened, stirring occasionally. Transfer cake to serving plate. Spread ganache over cake. Let stand 1 hour before serving to set up. Makes 12 to 16 servings. This was my first time using the Lucky Leaf Strawberry Pie Filling. I was surprised to see so many whole strawberries in a can! It was fabulous! I was a little concerned by the addition of the lemonade mix...but found it added a nice tart depth to the cake. Excellent twist! So there it is. I'm totally in love. Thank you Lucky Leaf for the fun new recipe! I'm putting it next to my Sweetheart Cherry Cake With Lemon-Rose Buttercream. Two cakes of love. There you go. Make a Chocolate Strawberry cake with Rum Ganache. Moist. Divine. Definitely worth the effort for your Special Valentine...or random day of the week...like Tuesday. Get the Printable Version or watch the video here. Xoxo! OH and I did say Giveaway right?! The fine folks at Lucky Leaf will be doing a giving away Lucky Leaf gift package to one of my readers. Leave a comment to enter. You'll be getting a complimentary gift package including Lucky Leaf Premium Pie Filling, the new Bake Your Heart Out Recipe Book, crisp mix and a pot holder. Just a fun little goodie box huh?! Winner will be announced on Friday! I just found your blog, and Wow! There are some pretty amazing things here! I love this blog. I'm going to try so many of your recipes, and this one looks so tempting! Thanks for sharing. WOW--Can't wait to try this recipe. I hope I do it justice. This cake looks really good! I just found your site last week and i absolutely LOVE your 52 Jars recipes! They are exactly what I was looking for. I can't wait for your book to come out! dang it. Now my mouth is watering, and I hate to drool on the keyboard! That looks incredible. Oh my stars, I just HAVE to try this cake! I'd totally hide in the closet with you and "lovely." Hehehe. Of course, we'd have to fend off the 5 children and my husband who'd bang down the door to share with us LOL! Thank you for the recipe. It looks delish! I really can't wait to try this! You had me at Ganache. Your cake sounds yummy! Love your blog! 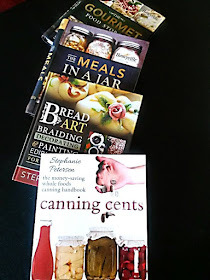 I am always one for giveaways that faciliate cooking and baking new recipes. Sign me up! Oh This really looks good. I made the one from last year and it was outstanding. This looks divine! I noticed you have older posts using dried foods. Some of your ideas look pretty good. Thought you might be interested to know that Survival.blog is looking for recipes to post utilizing the type of ingredients you are using. Yes. This giveaway is now over.